A new non-profit has been started called the Gabriola Island Clean Air Society. People sometimes take a laid-back approach to air pollution and often underestimate how both short term and long term exposures add up to health risks that can be serious. Heart attacks and strokes are much more common during high pollution days (and immediately afterwards), and particulate matter at the 2.5 micron scale (PM2.5) can accumulate in our blood stream and move into various organ systems causing damage from oxidative stress, inflammation, and other processes. With forest fires and ambient air pollution generated from non-point sources, there's sometimes a perception that nothing can be done to minimize exposure and that we should just get on with things. We sometimes hear comments like, "There's nothing we can do about it." The most important and successful way to reduce exposure to forest fire smoke is to stay indoors as much as possible, close windows, and to use air purifiers with HEPA 5-stage filtration. For those who question the value and accuracy of low cost particle sensors made by PurpleAir and other companies, consider this evidence. 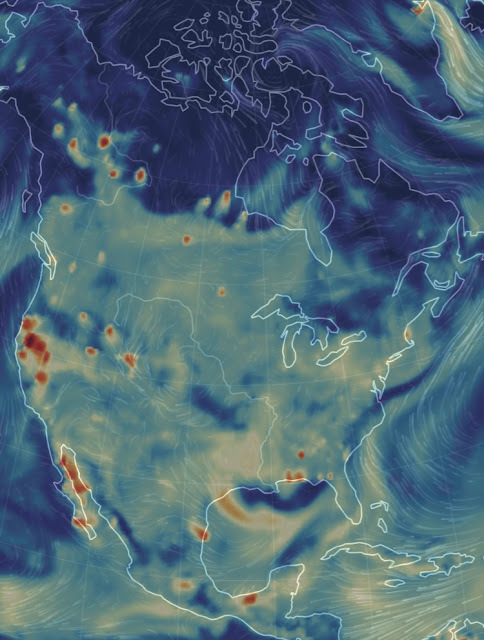 Here we have PM2.5 satellite predictive modelling from the Copernicusopen access database of surface PM2.5 for North America (note the hot spots likely from forest fires). When we compare a map of real-time sensors from PurpleAir it should be immediately apparent that they agree with the satellite models in general ways. 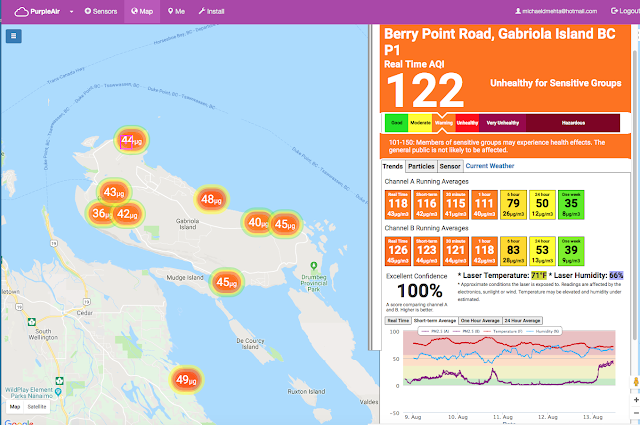 If you need more specific proof, the satellite estimate is giving a current surface PM2.5 reading of 33 micrograms/m3 and the PurpleAir sensors on Gabriola Island are bang on! How clean are the emissions from a SUV?